In Brick Underground’s Immigrant New York column we celebrate the immigrant enclaves that make our city the vibrant metropolis it is. We’re proud of our melting pot—a mixture of cultures, languages and customs from around the world. 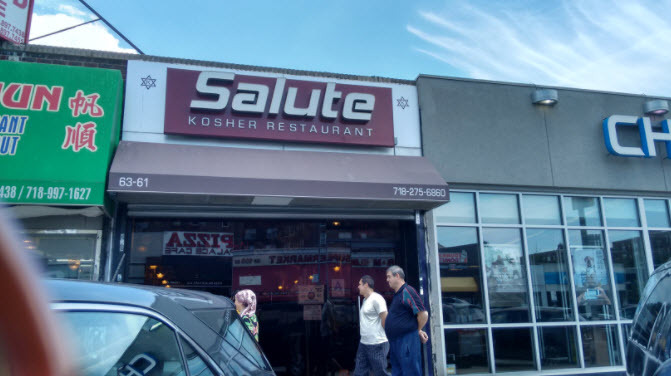 This time, we’re exploring the Bukharian areas of Queens. The exodus of Bukharian Jews from Central Asia to the U.S. began slowly in the 1970s and accelerated in the ’80s. There are now an estimated 50,000 Bukharian Jews in New York City with practically all of them living in Queens. 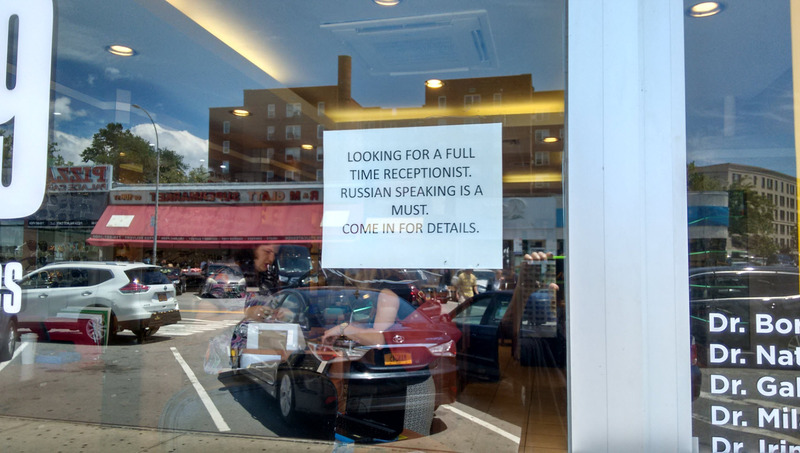 (This makes Queens the second largest Bukharian Jewish community in the world; Israel is the first.) It is thought that only about 100 remain in Bukhara, the city in Uzbekhistan that was once the epicenter of their world. The Emirate of Bukhara once included Uzbekhistan, Tajikistan and Turkmenistan, which is why this part of Queens is sometimes called ”Queenistan” by those familiar with the neighborhood. The Jews who fled these territories did so, as so many immigrant groups before them, to escape the prejudice and religious restrictions that they experienced in their former home. 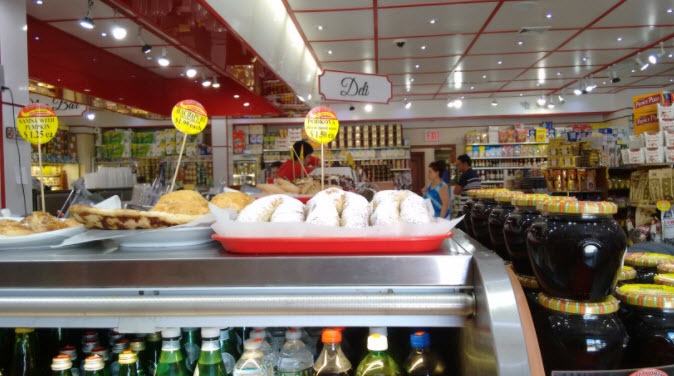 When the first Bukharians came to Queens, they settled in Forest Hills, and soon after 108th Street between 63rd and 65th avenues became the shopping/business center of their universe. The strip, often referred to as Bukharian Broadway, is still lined with Bukharian-owned meat markets, grocery stores, restaurants and other businesses where Russian is the lingua franca (although the Bukharians’ own language is Bukhari, a Tajik-Persian dialect that incorporates some Hebrew words). The community has grown so rapidly that now Queens Boulevard between the 63rd Drive and 67th Avenue subway stops on the R train can probably qualify as a Bukharian Broadway as well. The original Bukharian “settlement” eventually spilled over into Rego Park. Now, with families growing, the boundaries have expanded to include Kew Garden Hills, Fresh Meadows and Jamaica Estates. The synagogue is the center of communal life for many Bukharian Jews. In 30 years, the number of synagogues (“shuls”) has grown from 1 to 40 and perhaps even more if you count the private homes that have been re-purposed into shuls and those that host prayer groups. “Bukharians are conservative Orthodox Jews, so religion plays a big role in the community,” said the resident who asked to remain anonymous. The Bukharian Jewish Community Center at 106-16 70th Avenue and the Beth Gavriel Bukharian Jewish Center are two large and influential synagogues that offer a multitude of classes and services to the community. The chief rabbi of the community, Baruch Babaev, is headquartered at the first; Chazaq.org, a youth-outreach and social services organization operates out of the second. Many of the neighborhood’s not for profit institutions are supported by wealthy and influential residents and by one particularly wealthy non-resident: According to Adrienne Onofri, tour guide and author of Walking Queens, “a significant portion of the funds that it cost to build the new 70th Avenue synagogue came from Lev Leviev, a Bukharian Jew and diamond mogul ranked among the world’s richest people by Forbes Magazine.” As of mid July, Forbes posted his net worth at $1.18 billion. Aron Aronov, one of the first Bukharian Jews to settle in Queens (who is said to have helped many others to settle there as well) wants to share his love for his homeland with the rest of the world. To do this, he has dedicated “his money, life, soul, everything” and created the Bukharian Jewish Museum in a recently restored synagogue, Tifereth Israel, in Corona, a neighborhood not too far from Forest Hills and Rego Park. As with other groups that we have covered in our ongoing series on immigrant communities, the Bukharian Jews in Queens face challenges. Affordable housing, especially for young and growing families, is scarce, residents say. One resident told us that members of the community like to “live next to our parents,” but that is not always possible as real estate prices escalate. Assimilation into the broader culture is a concern as well. Imanuel Rybakov lives in the community and teaches a course at Queens College that gives an overview of the history and culture of the Bukharian Jews in Central Asia, focusing on the community’s achievements and downfall, traditions, music, language and literature. “We’re successfully integrating into American Jewish society but at the same time we’re losing a lot of our ethnic culture,” he told the Times of Israel last April. Hardly a day or night of the week goes by without a commemoration or celebration in the Bukharian community. One of the overriding features of Bukharian culture is the importance of commemorating the death of loved ones. In his column in the Jerusalem Post, chef Dennis Wasko writes that ”the cuisine of the Bukharian Jews is not known for robust seasoning and is instead known for subtle flavors developed with herbs, onion, garlic, peppers and many vegetables. The principal spices used are cumin, coriander, turmeric, pepper and a light touch of hot chili. Meat and poultry are used sparingly to enrich a dish, rather than as the main focus. Pasta is very common as is rice.” Wasko includes a recipe for chicken plov, a popular chicken and rice pilaf dish. Three other rice dishes that Shiman likes (“We kind of borrowed/inherited them from Uzbekhistan”) are green pilaf called Baksh; oshi-sabo, rice, meat, carrots and tomatoes cooked overnight and popular for the sabbath, and sirkoniz and pilaf with fried carp in a garlic sauce. The cuisines of both India and Korea are reflected in Bukharian cooking, since the Bukharian territories were along the Silk Road route. Bukharian samsa is similar to Indian samosa and is also baked in tandoor ovens, and their noodle soups with chunks of meat and veggies (lagman) and a spicy carrot slaw reflect the Korean influence. 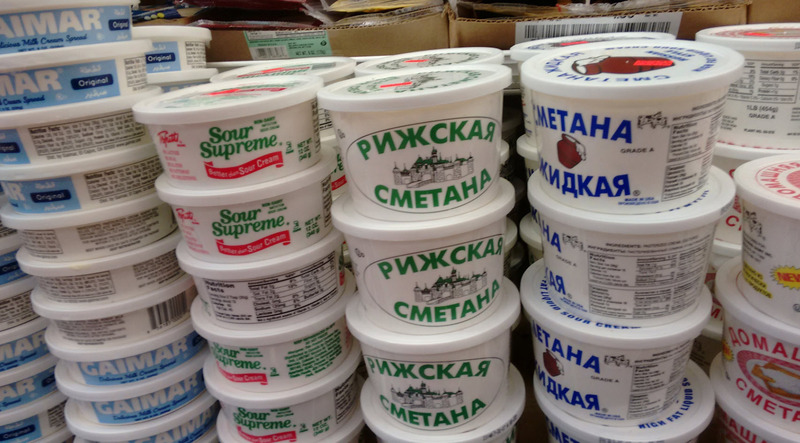 For an immersive Bukharian experience, visit Gastronom in Forest Hills, a specialty supermarket where everyone speaks Russian and buys imported Russian foods, take-out salads, main dishes, smoked fish, cheese and desserts (see photos below). If you prefer having someone else do the Bukharian cooking for you, Onofri recommends Cheburechnaya for chebureki, which “are like empanadas.” Onofri also likes Salute (pictured below) and Shiman suggests Arzu. 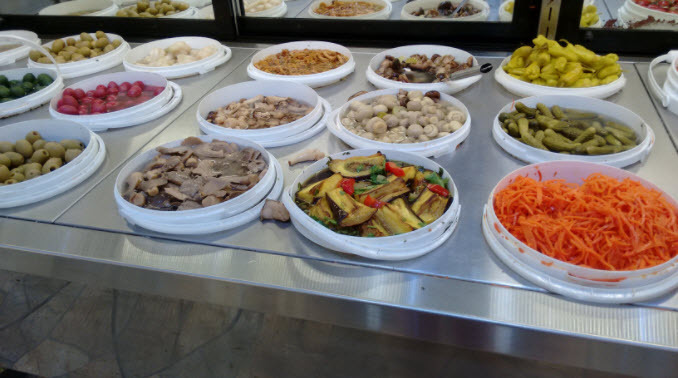 All of the above are kosher; the Bukharian neighborhood is a haven of sometimes hard-to-find kosher restaurants and markets. 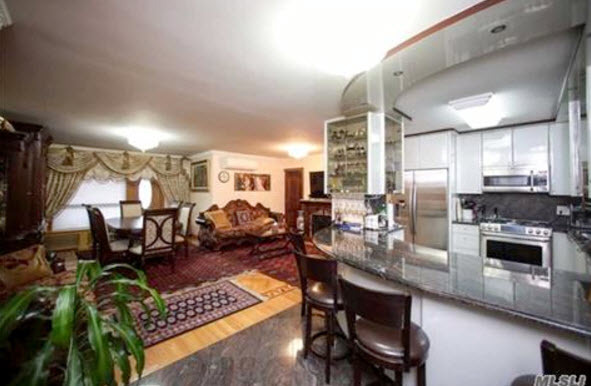 Shiman said real estate in Rego Park and Forest Hills is in demand. As an example, she cites Park City Estates, a co-op development in Rego Park that’s popular with the Bukharian community. 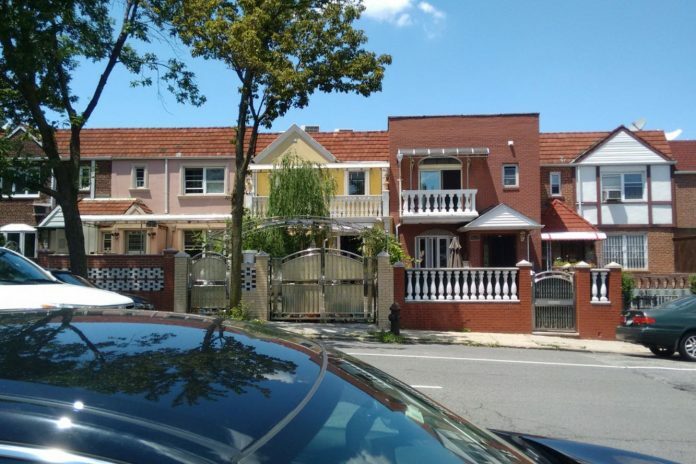 And attached homes in Rego Park are now asking over $1 million, she says. Until now, “that’s unheard of,” she says. 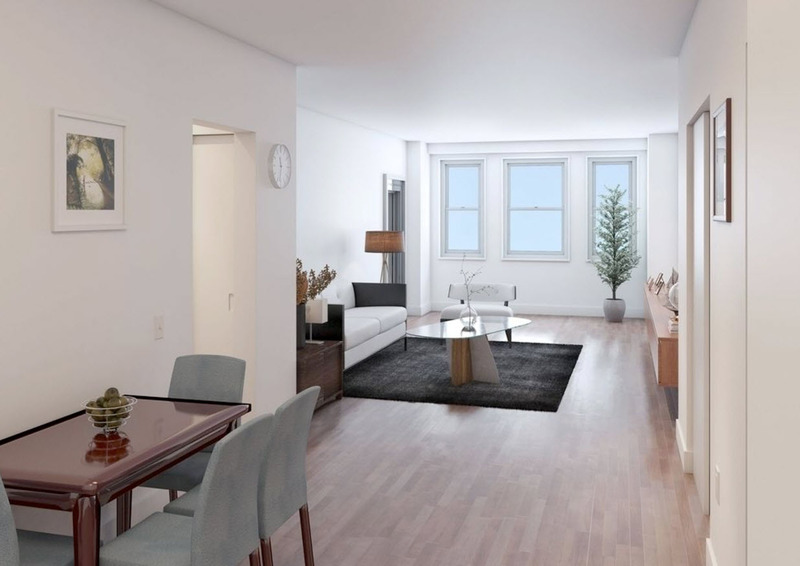 This three-bedroom,two-and-a-half bath attached house has a shared driveway and balcony. Asking price: $849,000. 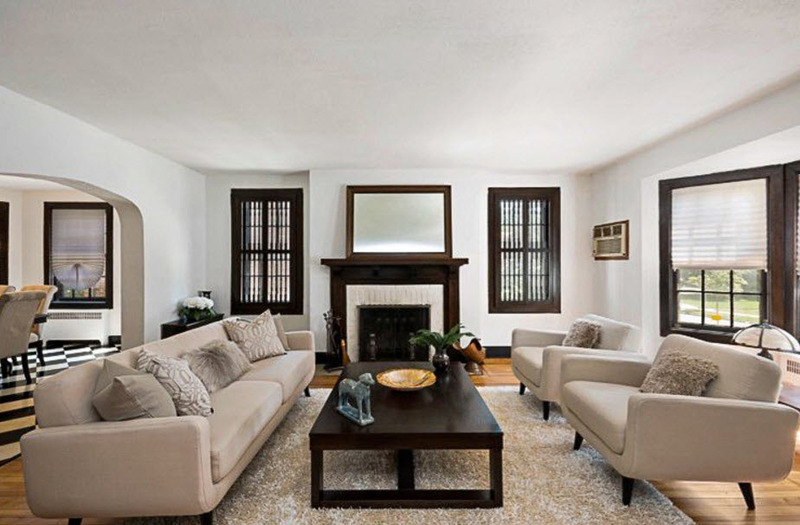 In Forest Hills, a four-bedroom, two-and-a-half bath fully detached stucco home with oak woodwork, a working fireplace and a porch with stained glass windows is priced at $1.899 million. 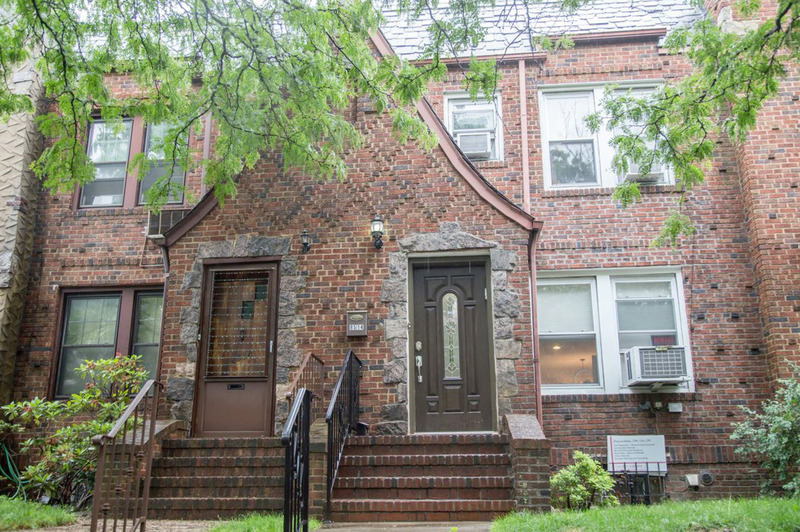 A 900-square-foot one-bedroom rental in a luxury, no-fee building on Queens Boulevard in Forest Hills, with outdoor space, is $2,395.